This one is coming out early this week for the sake of timeliness. 1. Thursday the 11th, the county IDA votes on whether to approve tax abatements for two downtown projects, Travis Hyde’s Carey Building addition and Ithaca Renting/Fane Org’s 130 East Clinton. The $4.1 million Carey Building addition adds 9,000 sq ft of incubator office space and 20 units, 16 of which are 300-450 sq ft studios. 130 East Clinton would add 36 units in three interconnected buildings on a steeply sloped parcel adjacent to the city police HQ, at a cost of $4.4 million. The multi-year tax abatements are in the range of $850k each. At the public hearing for the two projects, the Carey Building attracted little attention and dissent (which isn’t to say that there hasn’t been any), but Fane’s project attracted much ire. I’m not going to defend Fane’s character. Heck, the man’s been combative through this whole process. But I will side with the trustworthy opinions of Cornish, DeSarno and others that it contributes something to the very tight housing supply and it is a welcome resource. Denying the project by virtue of it being Fane is legally perilous and sets a bad precedent, and saying it’s a bad spot…well, it’s downtown Ithaca, where high-density lot use is expected. If Fane didn’t think he could get the environmental assessment approved he wouldn’t have proposed it. We’ll see what the board decides. 2. 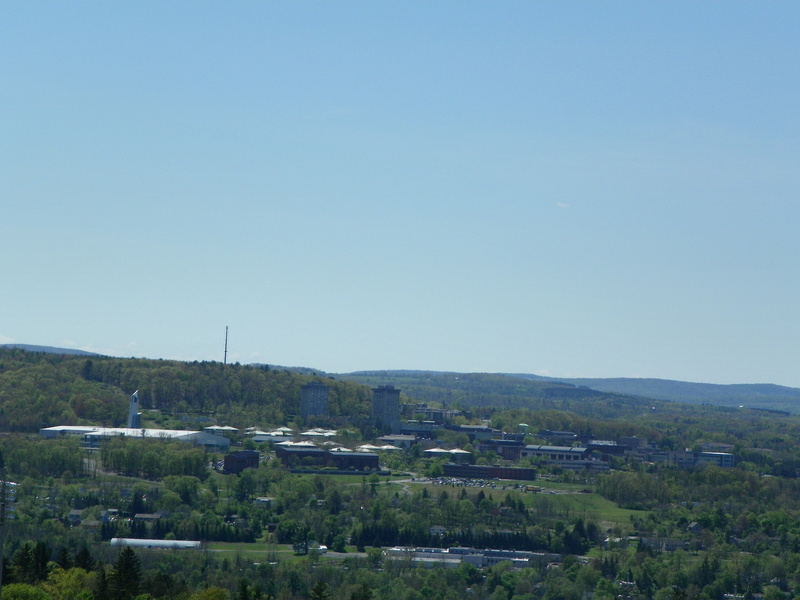 Up on South Hill, Ithaca College is holding meetings to flesh out its new master plan. Similar to the plan Cornell published in 2008, the purpose of the master plan (website here) is to determine what the space needs are for different assets and programs of the college, and figuring out where to put them. The master plan is being spearheaded by Perkins Eastman out of NYC. The previous plan by Sasaki Associates was published in 2002 with a refresher in 2010, so to get something out in 2015 would be appropriate. I did a writeup on the old IC plan way back in August 2008. Don’t expect any new plan to be followed to a tee- the athletic center ended up on the complete opposite of IC’s campus than originally planned. But it will provide insight as to what IC wants to build through the rest of the decade and beyond. Key things to looks for – dorm sites in case the college decides to expand its student population, and new program space, which tends to get built sooner or later (for instance, the Business School addition, Athletic Center, and Peggy Williams Center from the 2002 plan). 3. 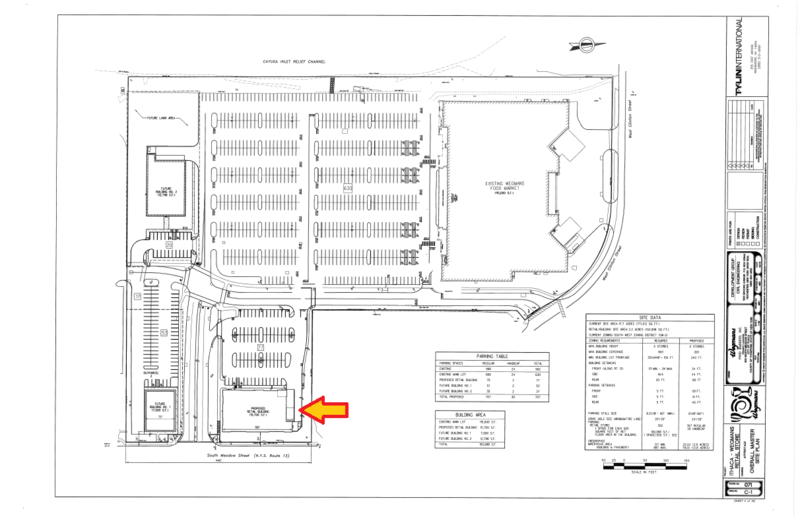 The 15,700 sq ft retail pad proposed by Wegmans is up for final review at the December planning board meeting, accordingly to the city projects memo. Compared to the initial design, the building has been rotated on site so that its long axis is now north-south, and the design itself received a number of tweaks, though the overall design theme is still the same as before. 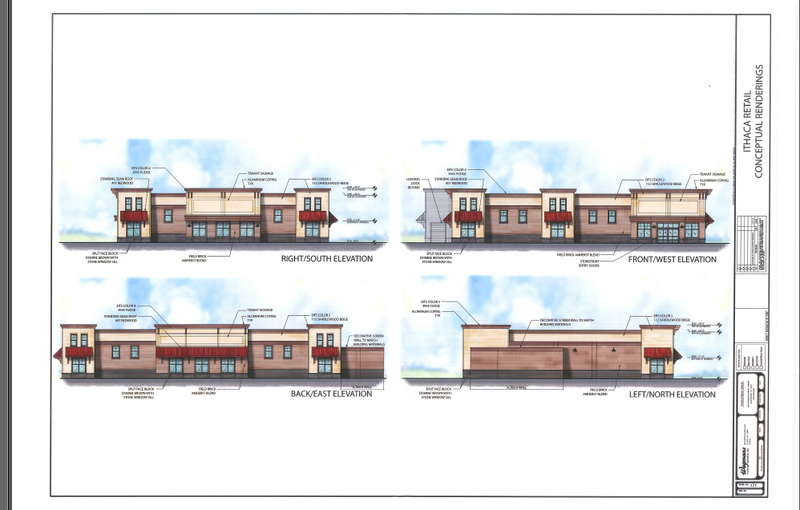 There have been some concerns raised by local wine and liquor store owners that it could be home to liquor/wine store, similar to what Wegmans has done at other sites in Johnson City and Buffalo. However, that is one of only a few ideas being floated, and the planning board doesn’t vote on what type of store can be allowed to open in a building, that’s a debate for the Common Council. 4. Looks like the Maguire plan has hit a dead end. According to the Times, the Maguires want the site rezoned rather than a specialized PDZ for the property. Looking at the PDZ regulations, the town’s idea would give more freedom in regards to property use, but it also gives the town the right to regulate the form and layout of the structures on site. I guess the Maguires aren’t fond of that. The town just completed its comprehensive plan and is trying to get its new form-based zoning together, so the Maguires are essentially usurping something the town spent years working on. In conclusion: no dice. The Maguires are still interested in doing something, but it may not be in Ithaca town. Though with as packed as the city is and as questionable as Lansing can be, I’m not sure they have many options. 5. 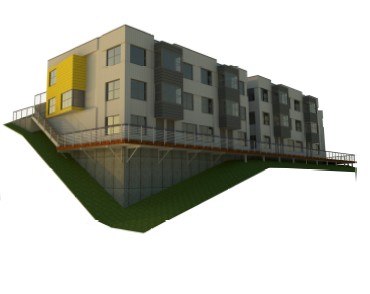 Over in Lansing Village, a mothballed project is getting a revival. 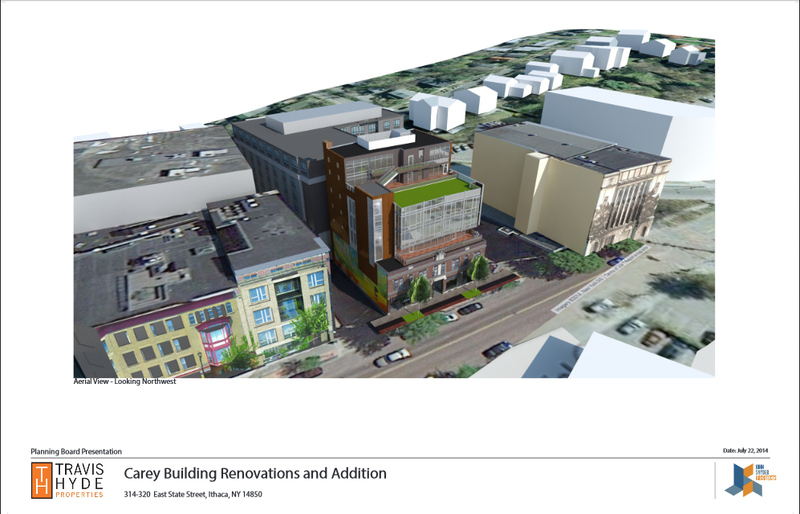 “CU Suites” (aka Manley and Richard Thaler, who own the Triphammer Marketplace) proposes a 3-story, 43,000 sq ft building on the west side of Cinema Drive, on a site that is currently a vacant lot. Interestingly, this site was previously approved for a mixed-use structure with those parameters in fall 2012, consisting of two commercial spaces and a 39-unit apartment building, but that plan was never carried out. The proposal before the board seeks “alterations and possible clarification” to the project. 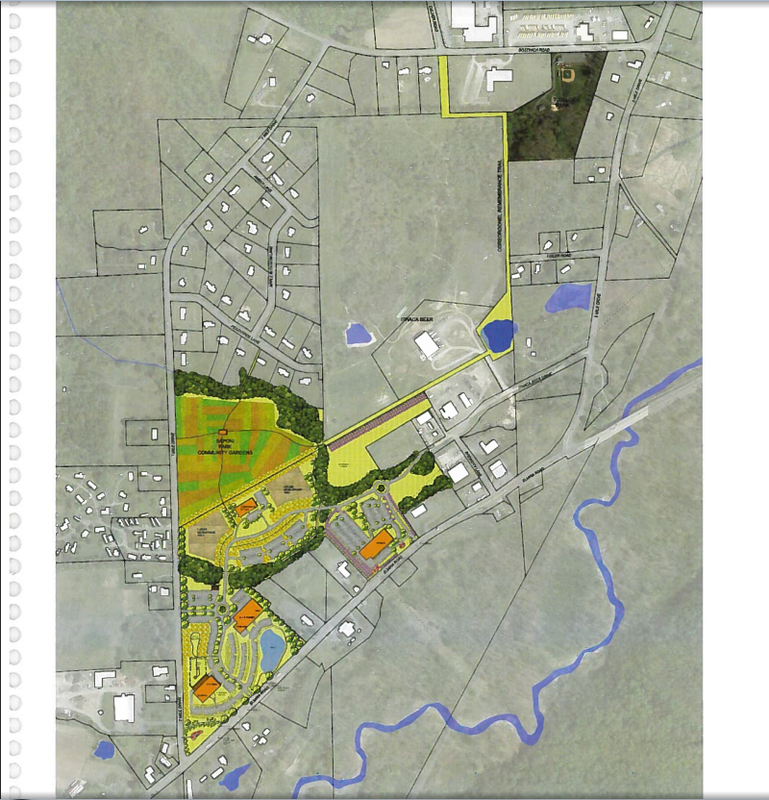 No updated renders on the village website, but a site plan of the previously approved plan can be found here. Before the previous plan was approved, the site has been marketed for an office building for two years, to no avail (the market for office space in Ithaca is pretty weak). We’ll see what happens, maybe this one will finally get underway. 6. For what it’s worth, the proposal at 707 East Seneca appears to be student housing. Applicant Todd Fox (a local developer who’s done a few other small projects in Ithaca and Dryden) wants to build six units with sixteen bedrooms, five 3-bedrooms and a basement 1-bedroom, situated next to four parking spaces tucked into the hillside (four more spaces would be out in the open). I’m not sure how so many units are possible, since I thought the maximum allowed on site was four units. I’d love to see how it looks, but there’s nothing on the city website (which, sidenote, has been “updated” and now has information of three separate websites, the new one, E-govlink and “TSSERR”; the notification emails don’t work and it’s driving me nuts). If something comes up, you’ll find it here sooner or later. Unfortunately it has become the norm and not the exception to ask for and expect to get special consideration tax abatements. Ferguson’s comment that “buildings get built by people with means” is disingenuous. It does not address the question. We continually reward the wealthy with other peoples money. Fane is gaming the system and many people don’t even think twice. Let’s be blunt. Mr. Fane is just a guy with money trying to expand his holdings. Nothing wrong with that. He is not the only guy but we are acting as if there was never any development until he came along. Let Fane have his money. Watch his properties sit vacant. Watch the tax burden get shifted, again and again, to everyone else. Watch elected officials and the rest scratch their heads and offer more rewards. Watch Ferguson come up with a few more idealized plans, if only… if only there were enough money to make things happen. Look, Fane is a bad guy. We are all about to collectively pay this guy and he will reward us with what is 100% in his best interests only. There will not be one second of consideration given to the needs and wants of anyone else. This is has been a proven fact for some time now. It is not wrong to say this. It is uncomfortable for people in power to say this. I’m just an observer with a computer. I don’t disagree about Fane. He knows how to the game the system, and has never cared about anything but his own pocketbook (which most developers do, he just takes it into the realm of bad faith and indecency). The only saving grace is that at 70+ years of age, his time left in this world is limited. As that comes to pass, the community can only hope his properties will end up with someone who actually cares. At least 130 E. Clinton is all residential. No storefronts for him to keep vacant.